IBM put together a video on network design and supply chain visibility for the electronics industry. This is a good example of how network design fits into other solutions for the supply chain. We have often heard that the pharmaceutical industry is not always a great fit for network design because the margins are so high. The argument is that the transportation and logistics costs are so small relative to the cost of the product that they don’t matter. Later, as other companies slashed outlays in response to the financial crisis, Tomé tacked in the opposite direction. During the dark days of early 2009, Home Depot embarked on an ambitious overhaul. It shed an inefficient process in which each store ordered products individually and spent $300 million to construct centralized distribution centers, which have saved time and money in ordering costs. “Home Depot readjusted the structure of the company, which allowed it to recover margin lost during the downturn and grow,” says Melich. The company’s operating profit margins, which fell from 11.5% in 2005 to 7.4% in 2008, have rebounded to 10.5% without a significant recovery in home-improvement demand or the housing market. Of course, the network modeling was only part of this project. But, when you are investing $300 million in new distributions centers, you want to make sure they are in the right place, they are the right size, and the right products flow through them– this is where network design comes in. And, from the article, you can get a sense of the pay-off from overall projects like this– profit margins up to 10.5% from a low of 7.4% without a significant recovery in demand. It is always interesting to see how different companies apply network design to their business. If you are doing these projects, then this list can help give you ideas. If you are teaching this topic, this list can help show the students the richness of the field. 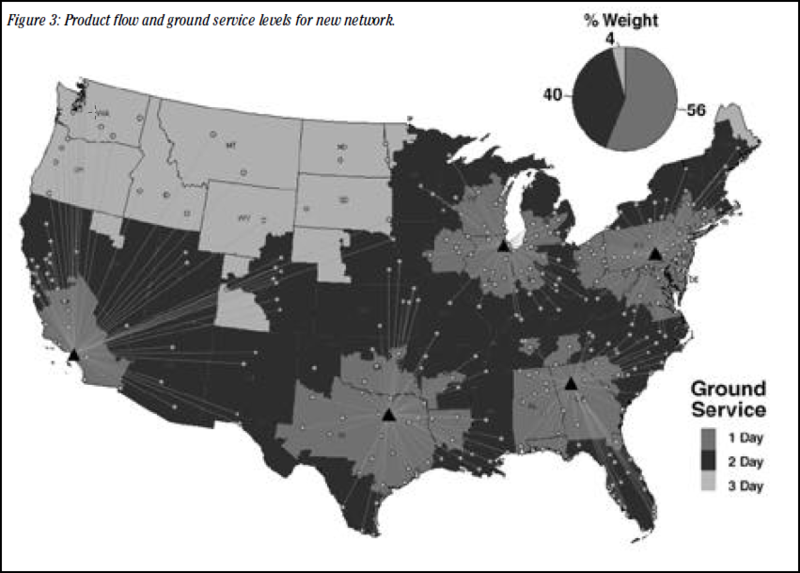 Network design is an important capability for 3PLs (Third Party Logistics providers). A Nov 2011 Inbound Logistics article on picking a 3PL partner listed “Optimization” as #2 on the list. A big part of optimization for a 3PL is network design. That is, a 3PL needs network design capability to help their customers run a better supply chain. Clearly, having this capability is important to a 3PL. This is a trend we are seeing with network design. More firms are relying on network design to make better decisions. If you are going to rely on network design, it is not only important for the network design analyst to understand the subject matter, it is important that the greater organization has an appreciation for this as well. The book, Supply Chain Network Design, can help you educate your organization on this important practice.